4Videosoft Video Converter is capable of converting all kinds of videos as you like. You can convert almost all the popular videos like MP4, MPG, FLV, M4V, AVI, WMV, etc to your favorite videos. 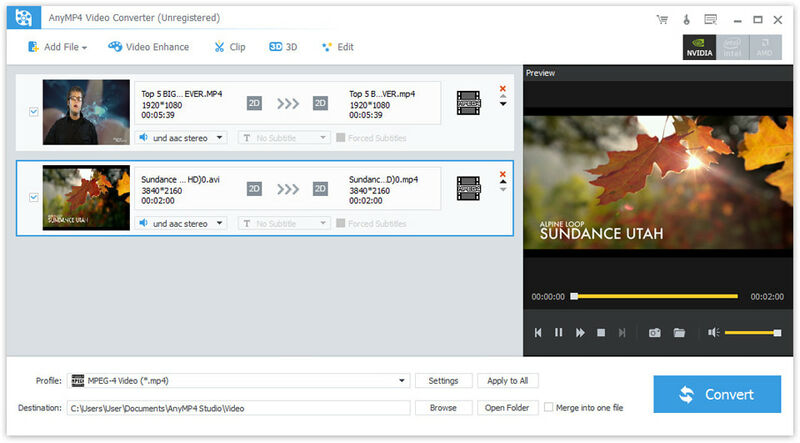 The Video Converter provides you with splendid editing functions like trim, crop, effect, watermark and merge and more to optimize the output video freely. 4Videosoft Video Converter is able to convert almost all kinds of videos to your favorite formats you like. It highly supports MP4, MOV, M4V, FLV, AVI, MKV, WMV, etc. These converted videos are able to play on Samsung Galaxy Note 3, Samsung Galaxy S5, HTC one, BlackBerry, iPhone 5S, iPhone 5C, iPhone 5, iPad air, iPod nano, etc. It allows you to extract the audio files from the source video and convert them to other audio format. The program supports AAC, AC3, AIFF, MP3, WAV, MKA, M4A, WMA and more. The Video Converter enables you to use the powerful editing functions to optimize the output videos. You are able to modify your output video by adjusting the Contrast, Brightness, Saturation, Hue and Volume. It can reset the video length and screen size to meet your demands. You are able to add your favorite image and text watermark without limitation. What’s more, you can choose the personalized option such as Video Encoder, Resolution, Frame Rate, Video Bitrate, Audio Encoder, Sample Rate, Channels, and Audio Bitrate for your output video. This Video Convert enables you to capture your favorite pictures when you are previewing the original video. Now it improved the conversion speed, and you can finish your conversion within several minutes. Convert AVI video files into SWF format in a jiffy; Insert converted SWF files in HTML pages and share them on the internet and on internet-capable multimedia devices such as mobile phone and media players with Flash Player installed.